In December 2005, the Indian government declared it had fewer than one case of leprosy per 10,000 people. This announcement of elimination, as defined by the World Health Organization (WHO), brought relief to a country known to have the highest burden of the disease. But the sense of relief is disappearing fast. 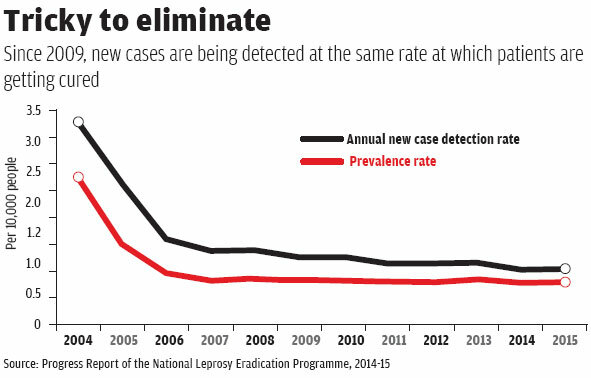 Since 2009, the incidence of new cases has remained almost constant (see ‘Tricky to eliminate’,). In fact, new cases are being detected at nearly the same rate at which patients are getting cured, says Kiran Katoch, former director of the National Jalma Institute of Leprosy and Other Mycobac-terial Diseases in Agra. In 2013-14 alone, 127,000 new leprosy cases were reported from across the country, making India home to 78 per cent of the new cases detected worldwide. That year, 433 treated patients relapsed into the disease. Worse, since 2014, India has joined the growing list of countries, including Brazil and China, where leprosy can no longer be treated by the conventional multi-drug therapy (MDT)—a specific combination of three pills which takes from six months to a year to kill the leprosy-causing germ, Mycobacterium leprae, and has helped countries significantly reduce the disease burden since its introduction in 1982. What’s worrying is that new patients are now showing resistance to MDT, whereas drug resistance is usually experienced by those who discontinue the treatment. Consider the case of Shahla (name changed to protect identity). The 24-year-old lives in a slum near Delhi’s Vijay Nagar area along with her family of eight. 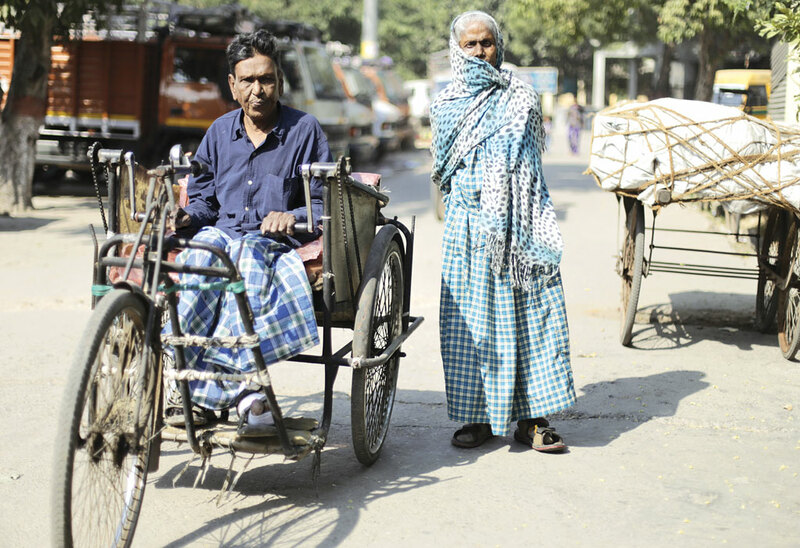 She says no one in her family or friends had ever contracted leprosy. So in 2007, when she developed skin lesions, she ignored it. The disease remained undiagnosed for two years till she developed numbness in the affected area, indicating peripheral nerve damage. Doctors treated her with MDT and declared her cured by early 2014. But within six months, she developed erythema nodosum leprosum (ENL) lesions, a complication of leprosy that can result in deformity. Subsequent blood tests showed that Shahla is resistant to MDT. Doctors at the Delhi hospital of The Leprosy Mission (TLM), an international charitable organisation, are now treating her with the second-line of treatment. They say Shahla will take another two years to be cured. So far, the long delay between the onset and detection of leprosy had been a major obstacle to “eliminating” the disease. It usually takes five to 10 years before the symptoms show up. 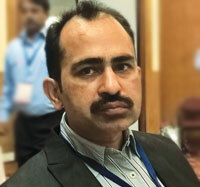 Now, with the emergence of drug-resistant strain of M leprae, its elimination will become further difficult, says Jalaz Rahmi, Medical Officer at TLM Hospital, Delhi. Diagnosis of the drug-resistant type of leprosy is time-consuming. Besides, the second-line anti-leprosy drugs are not available easily and for free. 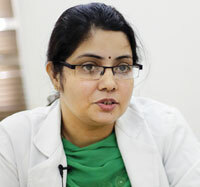 "Rising cases of drug-resistance since 2014, particularly among new patients, shows that resistant strains are actively circulating in India"
More than 13 per cent of the new cases and 44 per cent of the relapsed cases are showing resistance to rifampicin, one of the three drugs of MDT, say researchers with Stanley Browne Laboratory in Delhi, a centre of WHO for the surveillance of drug resistance in leprosy. The researchers arrived at the conclusion after diagnosing 215 new and 16 relapsed cases visiting the TLM Hospital, Delhi, between 2009 and 2014. The study was published in Clinical Microbiology and Infection in November 2015. “Rising cases of drug resistance since 2014, particularly among new patients, shows that resistant strains are actively circulating in India,” says Mallika Lavania, researcher with Stanley Browne Laboratory. The bacterium is also being transmitted continuously. This is evident from the fact that children, who rarely suffered from leprosy given the long incubation period of M leprae, now account for a significant percentage of the newly reported cases. In several states, according to the Progress Report of the National Leprosy Eradication Progra-mme (NLEP), 2014-15, children account for over 10 per cent of the new leprosy cases; in Lakshadweep the proportion is 75 per cent. So far, M leprae is believed to be transmitted through the discharge of droplets from the nose and mouth of an infected person. Prolonged contact and an over-crowded environment increases the risk. But recent evidence suggests that environment could also be responsible for spreading the bacteria, both resistant and non-resistant. To understand the mode of transmission of the bacteria, in 2011 researchers with Stanley Browne Laboratory in Delhi tested soil samples from leprosy endemic areas of Purulia district in West Bengal for the presence of M leprae. They collected 207 soil samples from bathing and washing areas around houses, common sitting places, community ponds and areas around borewells. They found DNA of M leprae in 71 of the 207 samples. The bacteria DNA was present in 27 per cent of the 82 samples collected from the houses of infected leprosy patients, and in 39 per cent of the samples collected from areas near washing and bathing places, notes the study published in Infection, Genetics and Evolution in November 2011. The presence of M laprae in soil could lead to indirect infection, the study suggests. The environment also acts as the reservoir of several other Mycobacterium species, which make people susceptible to leprosy. One such species is M gilvum. The Stanley Browne Laboratory researchers stumbled upon this rare species in 2014, while studying the transmission of M leprae in the population of an endemic village in Purulia. They isolated the species from the accumulated water in the drain connected to the bathing place of leprosy patients in the village. Previous studies had shown that M gilvum can grow rapidly and is resistant to antibiotics meant for several life-threatening diseases. Though there is no direct association of this bacterium species with leprosy, M gilvum belongs to the group of M vaccae, which suppresses the immune system of the host and increases susceptibility to leprosy, note the research paper, published in the International Journal of Mycobacteriology in October 2014. Between 2011 and 2014, the village with a population of 1,600 had reported 66 new leprosy cases. "Post-2005, we no longer have facilities to document new cases of leprosy or to know if a patient has relapsed or developed drugresistance"
“Unfortunately, since 2005 we no longer have facilities to document new cases of leprosy or to know if a patient has relapsed or developed drug-resistance,” says Sunil Dogra, additional professor of dermatology at the Postgraduate Institute of Medical Research, Chandigarh. After the declaration that India has eliminated leprosy, India stopped receiving funds from WHO, the World Bank and the International Federation of Anti Leprosy Associations (IELP); other diseases also took priority in public-health circles. As a result, door-to-door visits by leprosy control units in remote villages were called off, and medical staff were reassigned. Now that people have to report about leprosy on a voluntary basis, new cases remain under-reported. While WHO supplies MDT medicines free of cost, the Union government provides health care and pension to the affected people. Discontinuation of NLEP is also making it difficult for treated patients to avail regular care. 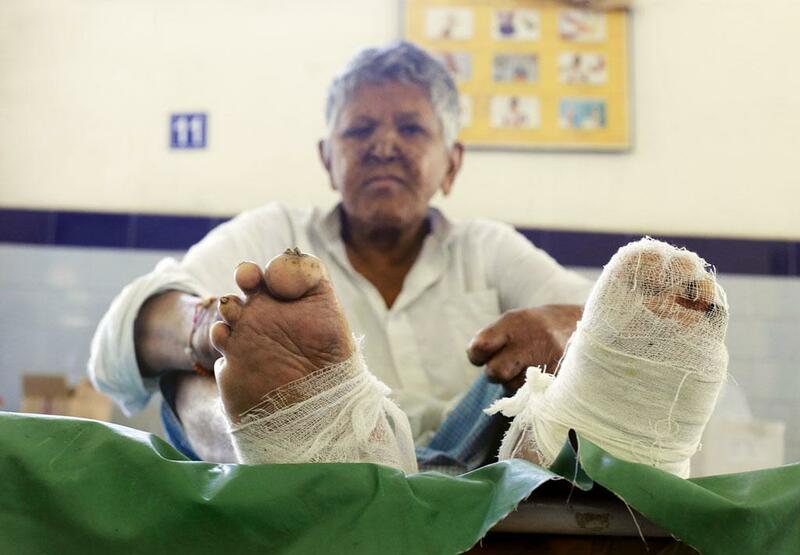 Gyanendra Singh from Hasanpur Kala village in Uttar Pradesh’s Meerut district has to travel to Delhi at least twice a year for cleaning of wounds and bandage as there is no leprosy clinic nearby his village. “Every time I visit Delhi, I end up spending Rs 1,000. All I receive from the government is Rs 300 as monthly pension,” says Singh. An analysis by researchers with the London School of Hygiene and Tropical Medicine, UK, and the Leprosy Mission Trust, India, shows that 27 per cent of the leprosy patients in rural areas of Purulia spend Rs 1,543 a month on treatment. About 53 per cent of leprosy patients suffering from ENL spend 30 per cent of their monthly household income on treatment. The study was published in PLoS Neglected Tropical Diseases in January 2015. The monthly pension, which varies anywhere between Rs 300 to Rs 1,800, is not enough to meet their expenses. Besides, not all receive the pension. “Poverty, fear of losing their daily wages, limited job opportunities coupled with difficulties encountered to sustain day-to-day life results in migration of patients back to their home towns abandoning treatment midway,” notes the editorial of the Indian Journal of Medical Research in January 2015. “This leads to poor treatment compliance, high drop-out rates, rising defaulter rates and possible emergence of drug resistance. It is essential to monitor drug sensitivity patterns.” The emergence of drug resistance is a cause for concern and a threat in the post-elimination era. It is important to monitor the emergence of rifampicin-resistant mutants as it is an important bactericidal component in MDT, notes the editorial. Lavania says there is an urgent need for development of drug resistance monitoring policy and a careful post-treatment follow-up of cured patients to detect relapse earlier and rapidly identify resistant strains. On November 3, TLM organised a conference in Delhi to discuss emerging needs in leprosy research in the post-elimination era. Experts attending the conference recommended that the government should urgently train young medical professionals in diagnosing leprosy and early nerve damage; empower public health centres to educate people about early reporting of the disease; not release patients from hospitals until the infection is under control; improve services to leprosy patients; and create a system to identify high-risk individuals. The government should act on these recommendations without delay. Should we treat chronic disease patients only if they agree to lifestyle monitoring?